there is very little online functionality in the Garmin anyway, weather and.... what else? Users will be able to wirelessly download cache descriptions, logs and hints, even if they're out in the field. Once a geocache is logged as found, it will be automatically uploaded to the user’s Geocaching.com profile. Premium Geocaching.com members will also be able to sync their geocaching lists directly to their device. Users can even use the LiveTrack feature to broadcast their location to family and friends and let them know they’ll be the first to find a new geocache. I doubt it. Even Groundspeak hasn't kept up with Wherigo. Hmm. It was available to order over the weekend. Maybe it was a holiday special? REI still hasn't listed them, even for pre-order, though Amazon has with the item shipping in 1-4 weeks. I'll PM anyone who wants to know. Website promoting etc is frowned upon in the forums. Well, I'm out on the lake this week (vacation) and I'm connected via mobile device. I can't figure out how to PM with where you can order the 7xx series. So, I'm going to post it here and hopefully I'm not violating any forum rules by doing so. There is someone on the GSAK forums that already has an Oregon 700, so they are (were) available somewhere. Why would GPScity be frowned upon in the forums? GPScity must have had a few in stock. I received my 700 today. I'm on vacation at the lake this week so I'm not able to really dive into posting photos or visa. What I can tell you is that the Live Geocaching is pretty slick. Zoom anywhere on the map, tap the refresh button, and the closest 25 caches closest to the center of the map load automatically. Once found, my notes and found log update my Geocaching.com account instantly. Complete with logs, notes, hint etc. Loading PQ's and connecting my GPS to my computer to download my finds, for me, is dead. Everything is working smoothly with no issues so far (knock on wood). I'll be testing other features and summarizing my experience next week. Can you load for offline use or load PQs directly wirelessly? Might as well just use the phone if you need to be connected with a cell signal. this! i always knew that the stand alones were the reason for pocket queries, and as people experienced live downloads they would realize just how much better it is. thank you for the brief review and experience. I'll be watching this. Somewhere I read (from Garmin) that you can also load PQs directly. You would still have to run them from the website, but can then access them as you would via any other API app. If you move your position and refresh again, do the original 25 geocaches remain, or are they deleted? They remain. Kept and refreshed whenever you want. There might be a limit but so far, after a few hundred, I'm still adding to my downloaded caches. Even Basic members can download three per day including, notes, hints, and logs. Fantastic! It really works better than I could have imagined. Screenshots. I've come home for a "shower" while out camping so I can share these images. I hope my wife doesn't read the forums. Live Geocaching screen before Live cache data is downloaded. Live cache data after downloading on the fly. Live cache data cumulative downloads. 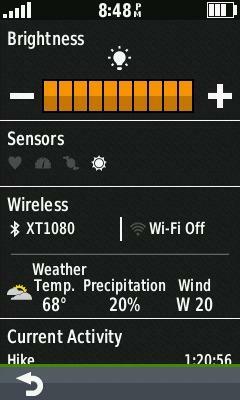 New Drop-down status screen that shows the status of all connectivity including ANT sensors, Wifi, Bluetooth. Also provides access to the setup of all the aforementioned. This feature is extremely handy! When you want to turn off Wifi and/or Bluetooth to save battery in environments where you'll have no connection, simply swipe down, tap, and disable. To reconnect, swipe down, tap, enable. Simple and easy. You'll also see notifications, weather, and current activity. I thought it worth mentioning that I haven't experienced any lock-ups yet. Even after extensive configuring, setup, and use. The software seems to be very stable. Also, the Live cache data downloads will show your geocaches as opened treasure chests if they're logged as found in your Geocaching.com account. Key when downloading new caches around areas where you've been caching before. Did you need to install any special app on your phone, or is it simply a bluetooth connection? Do the live caches get stored in a GPX file or in a special GGZ file? 1) Just a Bluetooth connection I think. I use Garmin Connect mobile so I connected through that app but I'm not sure if you need to. You can also connect through Wifi at your home or office. You must register your device to your account on geocaching.com a single time. You can check the registration page out yourself at "geo.co/garmin". Go to that address and, after you log in, it will take you to the registration page. A number will pop up on your GPS screen which you'll need to enter on that web page. Boom, done! 2) Not sure where the "Live" data is stored. Or how. Yet. I generally have no interest in finding any of the 25 closest caches to where I happen to be, but it would be somewhat useful if the Oregon 700 filters for the nearest caches of particular types or attributes. I often use my current Oregon in locations here there may be no cell or wifi service, so I assume that the search feature would do me little good there. I manage all of my caching through an iPhone app that allows me to search for the caches I want to find, save and filter them, and export the results as a gpx file - I load my gpsr by plugging it into a separate wifi router and using the app rather than transfer a pocket query through a computer. I would be interested if the 700 could load the gpx file directly from a phone app. In other words, would a phone recognize the 700 and transfer files to it as a connected device or is it limited to Groundspeak files? You are correct. I just tried this feature and it works perfectly. Create a PQ in my geocaching.com account and, once it runs, is available seamlessly on my Oregon. I can refresh the data anytime I wish directly from the GPS. I found one gripe and that's when I'm searching for something by name in the "Where to" app. Text input for me is a tad sluggish here and it may be due to the fact that I have 8 different map sets loaded up for different uses (the unit searches all the maps as each letter is typed so this is probably it). My impressions so far are very positive and have yet to experience a crash or instability. The Garmin Connect uploads work well also. I got home today after a short hike and the hike uploaded to my Connect account automatically. I went online to view the record of my workout stats and they're all correct. So far, so good. The Oregon 700 allows you to do this. You can scroll anywhere in the WORLD you want on your Oregon and the unit will download the 25 nearest caches to the center of the MAP. Or you can use your current location. You can also filter what is returned live. When you create your PQ on geocaching.com you can filter what caches the PQ returns. The Oregon 700 does everything you want it to in the above statement. It might be a different workflow than what you're used to on your iPhone app but just as easy, if not more so, than your current method. Or at least it sounds that way. 1) Generate a PQ with any app associated with geocaching.com. Filter (or not) the results you want. 2) Once the PQ runs on Geocaching.com, it will show up in the Geocache Lists on the Oregon 700. Done. Now you can "Sync" that list anytime you want to refresh the logs, etc. You can also download multiple lists. I'm not sure if the sky is the limit, but pretty darn close. I'm going to see whether or not I can load multiple 1,000 cache lists on the unit. Ok, it seems as though the sky might be the limit. I have four PQ's that have been run and transferred wirelessly to my Oregon 700 at the tap of a button on the GPS. All PQ's have 1,000 caches each. And, instead of manually loading an updated PQ every few weeks or months, I can update them all automatically on my Oregon 700 whenever I want providing I have a premium geocaching account. the 25 closest caches- this sounds like garmin got wind of what the geocaching apps can do, and decided to duplicate it. instead of using "my gps location" as the location determination, i normally turn off the gps antenna and scroll to an area i want to explore, and then select 10, 20, or 1,000 caches for that area. this is extremely handy when plans change and a different area is selected by the group to explore.... on the fly. does the 700 allow for selecting more than 25 local caches ? 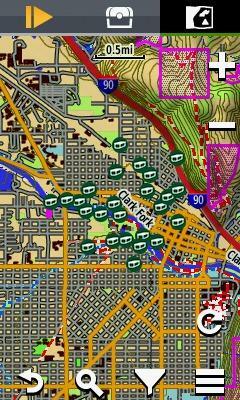 does the 700 allow for scrolling the map to select the LOCATION of those 25 caches ? the 25 closest caches- this sounds like garmin got wind of what the geocaching apps can do, and decided to duplicate it. I'm not sure if duplication is the result. But feel free to keep using your app. instead of using "my gps location" as the location determination, i normally turn off the gps antenna and scroll to an area i want to explore, and then select 10, 20, or 1,000 caches for that area. this is extremely handy when plans change and a different area is selected by the group to explore.... on the fly. Or, you can go to geocaching.com, build a Pocket Query of 1,000 caches, and it will appear on the Oregon 700.... on the fly. You can even do that twice for 2,000 caches. No, not "25 closest caches". You can select groups of 25 caches repeatedly, anywhere.... on the fly. You can even build multiple Pocket Queries on geocaching.com and they will appear on the Oregon 700. That's many thousands of caches.... on the fly. You can select as many as you want. That is more than 25. You can scroll anywhere on the map. This means you can select the "LOCATION" of those 25 caches. I prefer to record my finds on my device (phone or GPSr) in the geocache_visits.txt file. I then import that into GSAK to publish my logs from there. How does logging work on the 700? Does it let you mark a cache as found, add a note, and then store it locally? Or are you required to log online immediately (assuming you have wifi). Also, when you get back to wifi, does it automatically upload all your logs? Or do you have to trigger logging?? Anything else you can say about logging? Of course you don't have to log it immediately. First and foremost, the Oregon is a traditional GPSr and does not require a constant connection to the internet to function. You aren't required to use the built-in Geocaching Live app to geocache. But it's sure nice not to have to bring a computer on all trips anymore. 1. How does the screen compare with the Oregon 600 series? Is the same? Is it even brighter and easier to read? 2. Are dashboards still a thing? (IE, can we still have a geocaching dashboard atop the map with a compass and basic cache info?) All screenshots so far just show a narrow strip atop each page. 3. Are profiles still a thing? I noticed they included activity profiles similar to the eTrex touch. But are fully customizable profiles still there as they were in past models? 4. Garmin has changed some of its terminology. ABC sensor, 3D electronic compass. Am I right to assume that these are the same 3-axis compass and barometric altimeter as before? 5. How well does it connect wirelessly to a computer. Could I transfer tracks, routes, and waypoints to and from basecamp without a USB connection? 6. Did they fix the location/direction of the USB port so that you don't have to remove the clip to connect to a computer? What GPS chipset does it have? 7. Does the "Next Stage" command include additional waypoints from multi caches (like the Monterra does)? 8. Does the unit support "Custom Symbols"? Two excellent questions I also want to explore as soon as I get my hands on a 750t! So far as I know, the Monterra is the ONLY Garmin GPSr that properly supports additional multi-cache waypoints. And custom symbols is a must have option for me. The Monterra, being an android device, probably handles geocaches differently than any other GPS which relies on the limited structure of a GPX file. I suppose the API interface on the new Oregon could alleviate some of those shortcomings including linking additional waypoints and incorporating photos into the cache listing itself. But not being an android device, the Oregon's simpler operating system might not make it optimized for such tasks. Also, the Monterra can run the Official Geocaching App as well as partnered 3rd party apps that also run on your android cell phone, and that could be the difference. Geocaches with additional waypoints (such as multi-caches), when loaded on and Oregon GPSr or the Monterra, are stored in the exact same manner (within GPX files), The only difference is how the device indexes them on start up. The Monterra properly associates them with the parent GPX so they are available while viewing the parent GPX. That is the only difference. This should be as simple as adding a few lines of code to enable the feature on other devices. Has nothing to do with additional android third party applications. The screen looks very similar to me. There's something slightly different, like more color contrast or something, but it's hard to put my finger on it exactly. Dashboards are still a thing. Hasn't changed from the 650. You can have either the "Activity Mode" like the eTrex touch or "Classic Mode" like the Oregon 650. Either mode is fully customizable but Classic Mode feels better and more customizable to me. Not sure on either account. The form factor is identical to the 0regon 650 save for a few cosmetic differences. Yes, the Oregon 7xx supports custom symbols. I'm not sure about the chipset. But, it supports EPO (Extended Prediction Orbit) data which is downloaded via wifi. Apparently this EPO data can last up to 14 days and facilitates a sat-lock within 5 to 10 seconds. So does the 600 series. That is how they can auto switch orientation. Does it have the same GPS chipset as my Samsung galaxy s4? Once found, my notes and found log update my Geocaching.com account instantly. Complete with logs, notes, hint etc. Field notes or found it logs or either? Had previously the Oregon650 (still in use for trips on bicycle) and it was so off when geocaching! So I bought the Montana 680. So for me the most important question: what about precision when geocaching? well shoot, there goes my interest. it's 2016, and it still isn't ready for wireless transfers. Interesting.... I have an Oregon 600 and it's pretty good for both precision and accuracy. The wifi it offers appears to be extremely limited. It will connect with Groundspeak through a wifi network, but cannot connect directly with my phone, tablet, or computer. I don't use my 600 with a computer, but export gpx files to the unit from my iphone or iPad - and had hoped that the 700's wifi would allow me to do so without carrying a separate router and usb cord. My camera's wifi seems more functional than the 700. As to the other features, I wonder if the redesigned antenna and stated accuracy has any practical affect upon this game. well, they list "Bluetooth" and"wifi"in the spend of a lot of devices, but it only pertains to transferring to other Garmin models , if they are compatible, but not computers, laptops, phones, etc like is expected of a device with wifi or Bluetooth. we realized (at campfire) once that a new Montana could not use Bluetooth or wifi to share files. i was surprised, as was it's owner. if full file sharing is allowed, it would definitely be a boost to caching, and other outside activities. You can still share caches, waypoints, routes, tracks, and custom maps between units over the wireless sharing function. It's direct unit-to-unit transfer, not unit-to-computer etc. The bluetooth makes transferring larger files (routes and tracks and maps) faster than over the previously implemented Ant+ protocol (which is still there for transfer compatibility with older models). It's kind of a pain in that you can only transfer a single item to one other GPS at a time. So bulk transfer of data to multiple devices is best done via wired connection over a computer. But you're right. Connecting to other devices via bluetooh or wifi would be nice. It would be especially helpful if the wifi-enabled devices could connect directly with Garmin's (pitiful, but existent) cloud back-up associated with basecamp. What I would love to see with the wireless technology in GPS devices is similar to what I do with my smartphone (and tablet) and Cachesense. Like many folks, I manage my caches using GSAK. For Cachesense, I run a macro which packages up my selected caches and places them into a Cachesense database. That database is then uploaded to Dropbox. I then import that database from Dropbox into the Cachesense app. The ability to send a GGZ or large GPX file from my laptop, smartphone, or tablet to the GPS via bluetooth, or download GGZ/GPX files onto the GPS via WiFi would be great. Of course, the ability to manage where those files go (internal or external storage) would also be nice.